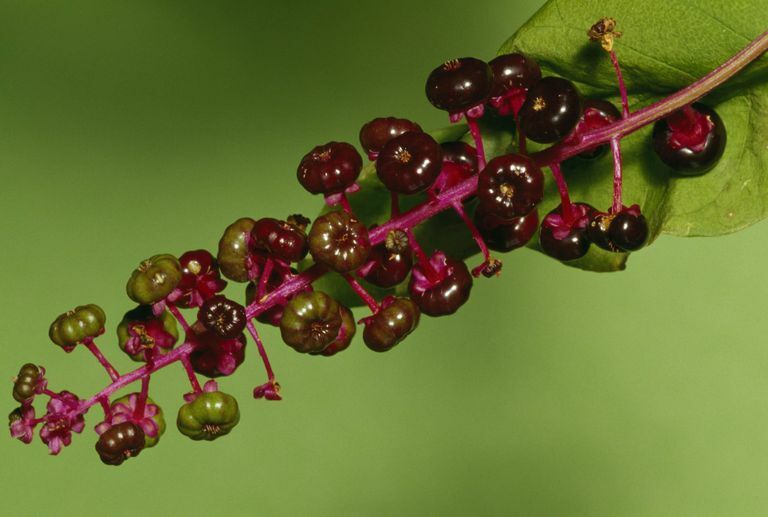 Pokeweed (Phytolacca americana) is a poisonous, herbaceous plant that has long been used for food and folk medicine in parts of eastern North America, the Midwest, and the Gulf Coast where it is native. It is an ingredient used in traditional Appalachian cuisine and made edible by cooking the young shoots of the plant repeatedly to remove the poisonous toxins. When cooked this way, it has a flavor similar to asparagus. Pokeweed is also known as poke, poke salad (or poke sallet), inkberry, cancer root, pigeon berry, and American nightshade. In traditional Chinese medicine, pokeweed is known as chui xu shang lu. Due to its potential toxicity, alternative practitioners sometimes refer to it as the "Jekyll and Hyde plant." Historically, pokeweed has been used by Native Americans as a purgative (to stimulate bowel clearance) and an emetic (to promote vomiting). Many traditional cultures believe that doing so "cleanses" the body. Its use in folk medicine can be traced back to a book written in the late 19th century called King’s American Dispensary, in which pokeweed was said to treat skin diseases and joint pain. Despite its toxicity, there are many alternative practitioners who believe that pokeweed can effectively treat a number of health conditions including tonsillitis, laryngitis, acne, scabies, painful menstruation, mumps, and even skin cancer and AIDS. Few of pokeweed’s health claims are supported by science. Even though pokeweed is known to be poisonous—not only to humans but to mammals as well—there are herbalists who believe that it can be used safely and is no less "toxic" than the pharmaceutical drugs used to treat many of the same conditions. However, there is little in the way of current literature exploring pokeweed’s medicinal properties. Many of the purported benefits are attributed to a compound called pokeweed antiviral protein (PAP) which proponents believe not only improve the condition of the skin, but also prevent or treat viral infections ranging from herpes to HIV. There are numerous homeopathic preparations used to treat tonsillitis that contain trace amounts of pokeweed, capsaicin, lignum vitae, and other natural ingredients. They are believed to lubricate and maintain the mucous membrane of the throat while alleviating pain, inflammation, and scratchiness. Despite the health claims, there have yet to be reliable clinical trials examining the effectiveness of homeopathy for acute tonsillitis. Pokeweed has frequently been used in folk medicine to treat skin conditions, including psoriasis, eczema, and scrofula (tuberculosis of the neck). This is a paradoxical association given that pokeweed can cause illness if it comes into contact with broken or abraded skin. Moreover, contact with the root, stem, or leave can cause a spreading, blister-like rash similar to poison ivy. Despite this, pokeweed is believed to exert powerful anti-inflammatory effects that may help relieve localized pain and swelling. One of the few studies to have investigated this dates back to 1975 in which pokeweed was among the substances that could suppress the inflammatory immune response when applied topically to the skin of sheep. Whether this response can be rendered safely (and consistently) in humans is debatable given the high risk of toxicity. One of the bolder claims made by proponents of pokeweed is that PAP may help prevent or treat certain cancers. It is, in fact, the toxic nature of pokeweed that some believe can suppress the mechanisms that trigger the development of cancer cells. PAP is known to inhibit a molecule in all living cells called a ribosome. Some ribosomal mutations are loosely linked to certain cancers, including breast cancer, melanoma, multiple myeloma, and leukemia. A 2012 review of studies suggested that PAP has the potential to be converted into an effective immunotoxin, stimulating immune cells to attack tumors or cells in the same way that targeted therapies do. The researchers cited a 1993 study in which mice were successfully treated for leukemia with a combination of a PAP immunotoxin and the chemotherapy drug called cyclophosphamide. They also noted a 1993 study in which a PAP immunotoxin was engineered to bind to immune cells, known as CD4 T-cells, that HIV primarily targets for infection. None of this suggests that consuming pokeweed would have anywhere near the same effect. (The dose needed to achieve such clearance would all but certainly be life-threatening.) What the evidence does hint at is a promising, new avenue of drug design—however, it is one that would likely take years to develop. Every part of the pokeweed plant is poisonous, including the root, stems, leaves, and berries. The concentration of phytolaccine gradually intensifies as the plant ages (with the exception of the berries, which are more poisonous when green). The same may occur if any part of the plant comes into contact with broken skin, albeit less severe. Others may develop contact dermatitis after touching the plant with unbroken skin, triggering inflammation and a painful, blistering rash. Severe pokeweed poisoning can trigger convulsions, bloody diarrhea (hematochezia), and bloody vomiting (hematemesis). Death usually occurs as a result of respiratory paralysis. Call 911 or seek emergency care if you experience vomiting, diarrhea, cramps, or irregular heart rate or breathing after eating or coming into contact with pokeweed. While some believe that homeopathic remedies containing pokeweed are safe for human consumption, it is important to remember that they have not been evaluated for safety by the United States Food and Drug Administration (FDA). As such, they need to be used with caution, ideally with the oversight of a doctor. Not much is known about how pokeweed affects other drugs you may be taking. However, based on how the body responds to pokeweed, it would be safe to assume that interactions do exist—some could be potentially significant. Pokeweed contains compounds that are known to cause the agglutination (clumping together) of red blood cells. As such, it may need to be avoided if you are taking anticoagulants (blood thinners) like Coumadin (warfarin), heparin, or Plavix (clopidogrel). Pokeweed can also cause a drop in blood pressure, potentially triggering hypotension (low blood pressure) in people on antihypertensive drugs like ACE inhibitors, beta blockers, and diuretics (water pills). Always advise your doctor about any supplements or herbs you may be taking to avoid potentially serious drug interactions. There are no guidelines directing the safe use of pokeweed or pokeweed remedies in humans. As a rule, the consumption of fresh pokeweed should be avoided. For health purposes, pokeweed is most often sold as tinctures or extracts. Appalachian herbalists often create tinctures by preserving the root or juice of the berry in whiskey. Modern homeopaths employ other methods of extraction (including steam and solvent distillation) to obtain the extract. These are then infused in a carrier oil, lotion, or wax-based balm. Many commercial tinctures and extracts are sold in dropper bottles, purchased either online or through specialty homeopathy stores. Since most do not tell you how much pokeweed is in them, you would be best served not to exceed the recommended dosage on the product label. Other manufacturers sell dried "wild-crafted" pokeweed or pokeweed powder. These are used by home herbalists to make tinctures and salves but should be avoided by the consumer due to the high risk of toxicity. Commercially produced ointments and balms are also available. Due to the lack of research, pokeweed medicines should never be used in children, pregnant women, or nursing mothers. Ensuring that a pokeweed product is safe can be difficult given that so few undergo testing by the United States Pharmacopeia (USP), ConsumerLab, or other independent certifying authority. Moreover, as a dietary supplement, pokeweed extracts do not need to undergo the rigorous testing that pharmaceutical drugs do. Instead, they have to adhere to certain guidelines and labeling practice outlined by the FDA. This includes informing the consumer that supplements are not intended to diagnose, treat, cure, or prevent any disease or health condition. In the absence of USP certification, purchase products that include the concentration of pokeweed in the product label (generally, look for products containing no more than 20 percent). Also, aim for products that are certified organic under the standards of the United States Department of Agriculture (USDA). How do you treat pokeweed poisoning? If you or someone you love is experiencing symptoms of pokeweed poisoning, call 911 or the national toll-free Poison Help hotline (1-800-222-1222), where you will be connected to a poison control center in your area. Do not induce vomiting unless a doctor or someone with poison control tells you to. Doing so can risk chemical aspiration (the inhalation of vomit and poison into the lungs). Treatment may involve gastric lavage (the administration and removal of small volumes of fluid to clear the stomach), activated charcoal, laxatives, and supportive care. Hospital observation may be needed. Mild to moderate cases tend to improve within one to two days. How do you treat pokeweed rash? Unless severe, pokeweed rash can usually be treated at home. Treat it as you would poison oak by washing the skin thoroughly as soon as possible. Avoid scratching and apply calamine lotion to help dry and heal the injured skin. While an over-the-counter (OTC) 1 percent hydrocortisone cream and nonsteroidal painkiller like Advil (ibuprofen) can help reduce pain and inflammation, avoid topical antihistamines and benzocaine anesthetic creams which may cause an allergic rash on top of the pokeweed rash. Domashevskiy, A. and Goss, D. Pokeweed Antiviral Protein, a Ribosome Inactivating Protein: Activity, Inhibition, and Prospects. Toxins (Basel). 2015 Feb;7(2):274-98. DOI: 10.3390/toxins7020274. Stetler, K. Tonsillitis and sore throat in children. GMS Curr Top Otorhinolaryngol Head Neck Surg. 2014;13:Doc07. DOI: 10.3205/cto000110. McGeady, S. and Buckley, R. Depression of cell-mediated immunity in atopic eczema. J Allergy Clin Immunol. 1975;56(5) 393-406. DOI: 10.1016/0091-6749(75)90133-5.